In order to understand the significance of the escalation of events following the September 2017 referendum about Kurdish independence on the territory of the present Iraqi State and the reactions of the governments in the region and worldwide, we have to go back to historical developments that took place more than a century ago. This article is published at the same time as "Erdogan’s ‘New Turkey’: a prime illustration of capitalism’s senility" and we recommend reading the two articles together. As we have developed in the above-mentioned article and in an article on imperialist conflict in the Middle East in International Review 117, at the end of the 19th century the Ottoman Empire had entered a long process of decline and fragmentation. Already before World War 1, in the Balkan wars, Bulgaria, Albania, Western Thracia (and Salonika) split from the Ottoman Empire. The second phase of fragmentation occurred after the Ottoman Empire joined the German side in WW1: the European powers France, Britain and Russia worked out a plan of dividing up the remaining components of the Ottoman empire amongst themselves. In 1916, on the basis of the secret Sykes-Picot treaty, France was to receive what later became Lebanon and Syria, Britain was to gain control over Iraq (except Mosul), Jordan, Palestine and Egypt – as well as the Arab peninsula (today's Saudi Arabia). Czarist Russia was to lay its hands on most parts of northern Kurdistan and the Czar was also hoping to use the Armenians for his ambitions. However, following the Russian revolution in 1917 the Soviet power renounced any imperialist ambitions. In 1920, in the peace treaty of Sevres (Paris), the remaining Turkish heartland was to be divided amongst the colonial powers France and Britain. Large areas of Turkey were to be handed over to Greece, an independent state of Armenia was planned for Eastern Turkey, and the Kurds were to receive an autonomous status in the south-east. Only a small part of the heartland of Turkey was to remain Turkish. The army general Mustafa Kemal refused to recognize the treaty and began to organise military resistance. The Armenians and Greeks were quickly defeated, the sultanate abolished, and Kemal became the leader of the new Turkish “rump” state. After the division of the booty of the former Ottoman Empire and the setting up of new “national” units – Syria, Jordan, Iraq - by the colonial powers, the Kurdish population which had been living in one Ottoman Kurdistan for several centuries was then divided into the territory of 5 states (Turkey, Iraq, Syria, Iran, Armenia/Russia). Today, almost one century later, the Kurdish population still lives on around a third of Turkish territory, in the northern part of Iraq (Mosul, Kirkuk, Erbil, etc. ), in the Iranian Western part, in Syria's north-east and a smaller number in Armenia. The way the residues of the former Ottoman empire were partitioned by the two co-winners of WW1, France and Britain, meant that no space was left for the formation of a Kurdish state proper. At the same time the seeds for the ambitions of Kurdish nationalism were laid by these “partitioning” powers themselves. At the same time Turkey, Iraq, Syria and Iran have always feared and combated Kurdish aspirations for the formation of a separate Kurdish state. This spectre has haunted Turkish and Iraqi governments in particular, because any separate Kurdish state would have meant a large secession of territory from these countries (in the case of Turkey 30%). During the past century every Turkish government has warned they would never tolerate the formation of a Kurdish state outside of Turkish territory. Historically, the Kurdish populated areas have been more backward in comparison to the rest of the region. Large parts of the population live in mountain areas, where economic development has been much slower. The social structure has been dominated by tribal leaders and clans. Apart from oil, which was discovered in the early 1920s, there are hardly any raw materials, and for more than a century there has not been any real industrialisation. As a consequence large parts of the population either survive through agriculture or by migrating within the larger area or looking for jobs in Europe or elsewhere. While the four Kurdish populated countries Turkey, Iraq, Syria and Iran all have one common interest - preventing the formation of an autonomous separate Kurdish state - the situation of the Kurds and the intensity of conflicts between the Kurds and these countries has never been the same. And within each Kurdish populated zone, the factions of the Kurdish bourgeoisie fighting for Kurdish interests have constantly been strongly divided, either due to their social dominance by some clan/tribe or because of different social and economic interests. In particular, the land-owning factions have shown no sympathy for the poorer populations and their economic and social demands. During this whole period Kurdish nationalist forces have repeatedly resorted to violence – against other Kurdish groups or against Armenians And Kurdish nationalist groups have repeatedly tried to impose Kurdish identity on minorities living in Kurdish dominated areas. The entire Kurdish area is "surrounded" by other countries and it has no access to ports, making the Kurds entirely dependent on “good will” and negotiations with other countries. These can in turn blackmail the Kurds and extort high taxes for letting Kurdish oil transit through pipelines or trucks through Turkish territory. On an economic level a separate Kurdish state could never be viable. The first aspirations for Kurdish independence, which were voiced when the Ottoman Empire began to show its first cracks, were those of Ubeydullah in 1880, who demanded political autonomy or outright independence for Kurds and the recognition of a Kurdistan state. This was quickly and easily crushed by the Ottoman rulers. Before the Turkish Republic was proclaimed in 1923, in the wake of WW1, the British and French colonial powers pretended to offer the Kurds help in their striving for independence, while in reality they had divided the region in such a way that there was no place for a Kurdish state. In 1925, barely two years after the formation of the Turkish Republic, the first significant Kurdish rising was organised by Sheik Said; it had a strong religious tinge. The Turkish state, which had gained experience in expelling and deporting Armenians and Greek populations, launched a severe repression and massive deportations of Kurds. Between 1927-1930 there were again repeated Kurdish risings in Ararat. The Kemal regime denounced these risings mainly because of their religious cloak in order to justify its “secularist” policy. In 1930 Iran and Turkey signed a deal in which Iran agreed to close its borders, preventing the exodus of refugees and armed Kurdish fighters. After the risings in the province of Dersim between 1936 -38 – all of which were crushed with many massacres – for more than 20 years there were almost no Kurdish armed attemps to achieve more independence from Turkey. Yet in 1960 when the army staged a coup d'état in Turkey, one of the justifications for the coup was the danger posed by Kurdish secessionist attempts. Once again the use of the Kurdish language, dress, folklore, and names was prohibited. The continued repression led to the reemergence of Kurdish nationalism in the 1960s and 1970s. In the 1970s Kurdish nationalist ambitions were propagated by a new group – the Partiya Karkeren Kurdistan (PKK), or Kurdistan Workers Party founded in 1978. The PKK claimed to oppose the local authorities and landlords who were mostly dominated by clans and chieftains. The PKK has been financing its activities through voluntary payments, donations and, despite its leftist verbiage, through blackmail, extortion, income through drugs and arms trafficking and more recently through human trafficking of refugees. In 1984 the PKK started a guerrilla insurgency until the ceasefire of 1999. In 1999 its leader Öcalan was arrested and sentenced to death. Following Öcalan's appeal to the PKK to stop its military fight in Turkey, the PKK ceased its military activities until 2004. This in turn led to repeated military attacks by the Turkish army against PKK hold-outs in Northern Iraq until 2011. As we shall see, it was only in 2012 that a short spell of relative calm began in the Kurdish areas in Turkey because of strategic moves by Erdogan! Looking back, we can see that the Turkish governments practiced a policy of alternating between very limited concessions and, more often, heavy repression – with waves of increasing military resistance by armed Kurdish militias, namely the PKK. In the territory of Iraq the conditions for the Kurdish population were different. Following their experience in India and in other colonies, the Britsh conceded the northern Kurdish region in Iraq some autonomy and recognized their nationalist claims in the hope of pre-empting Kurdish nationalist strivings on Iraqi soil. As an adjunct to their "divide and rule" policy and their backing of reactionary Kurdish elements, the British, in the face of large-scale resistance also developed terror bombing from the air with Churchill sanctioning the use of poison gas. In the meantime the Provisional Iraqi Constitution of 1921 even granted two ethnic groups (Arabs and Kurds) equal rights, and towards the Kurds the British applied a similar “divide and rule” policy: Kurdish tribes in the countryside received special legal jurisdiction and tax benefits. They were informally guaranteed seats in parliament and were outside the jurisdiction of the national courts. The Kurdish landlords in turn had to collect taxes for the British rulers. In 1932 Iraq became an independent state. All through the 1950s Baghdad repressed Kurdish political rights, banned nationalist political parties, destroyed Kurdish villages, forcibly militarised the area and imposed resettlement (especially in petroleum-rich areas. In 1961 Iraqi Kurds began an insurgency against Baghdad. The Ba'ath party which came to power in 1963 launched a severe repression. In 1970 the Iraqi government and Kurdish leaders signed a Peace Agreement. None of the promises – Kurdish self-rule, recognition of the bi-national character of Iraq, political representation in the central government, extensive official language rights, the freedom of association and organisation - were ever implemented. During the 1970s, Iraqi Kurds pursued the goal of greater autonomy and even outright independence against the Ba'ath Party regime; but at the same time the two main Iraqi Kurdish groups around Talabani and Barzani repeatedly fought against each other. The two groups were part of the same ruling class and never divided by any class frontiers. Both could one day fight each other – with the support from one of the governments in Baghdad or Teheran – and the next day they could be allies against the governments they had been supported by. Already in the 1960s Iran had become an important force in the Kurdish autonomy movements in Iraq. Teheran and Baghdad were at odds over a border conflict in the Shat al-Arab. Iran supplied the Iraqi Kurdish group around Barzani with weapons and money. Following a rapprochement between Baghdad and Moscow in 1972 and the nationalisation of the oil industry, the USA tried to use the Iraqi Kurds to destabilise Iraq. In the next military clash in 1974-1975 in northern Iraq, between Barzani-led Kurdish troops and the Iraqi army, Iranian aviation destroyed Iraqi aircraft. Following a deal over the border question between Iran and Iraq, Iran ceased its military support to the Kurds. Again, a wave of repression and displacement began – Peshmergas withdrew to Iran, scores of Kurdish villages were destroyed. Between 1979-1982 the clashes amongst the Kurdish organisations reached a peak. During the Iran-Iraq war (1980-88) Iran tried to instigate Iraqi Kurds against Baghdad. The latter retaliated in 1988: in the struggle against Kurdish combattants of the PUK (Patriotic Union of Kurdistan) and Iranian troops in March 1988, Baghdad ordered a massacre of Kurds in the city of Halabja, where chemical weapons were used indiscriminately. Between 1986 and 1989, Iraqi troops and militias killed between 50,000 and 180,000 Kurds, many of them civilians. About 1.5 million people were displaced. After the first Gulf War 1991 and the rapid victory of the US-led troops against Saddam Hussein, the Kurds hoped for more independence. It was in this process, entirely dominated by imperialism, that certain groups, most notably the International Communist Group (GCI) saw a "revolutionary" and proletarian uprising. Like Rojava today, these were completely non-existent and rather showed the GCI's weakness for supporting nationalist movements and imperialist pawns. During this time, NATO-enforced no-fly zones were established over the Kurdish areas, which gave them some protection against Baghdad and compelled Saddam to accept some level of self-government. The Kurdish Kurdish Regional Government was founded in 1992. Yet again between 1994-98, Kurdish groups in Northern Iraq clashed repeatedly, while Baghdad and Ankara intervened militarily as well. Following the US-led invasion of Iraq in 2003, the area was declared autonomous with some levels of self-governance. This limited autonomy (bigger than in comparison to Turkey or Iran however) would have been unthinkable without the US-led invasion of 2003. These Kurdish-controlled state structures have continued until today. 100 years of the Kurdish population's history shows that the Kurds in Iraq have been the most subjected to massacre and displacement, the most caught up in fights between rival bourgeois factions, who took sides with or were used by Baghdad or Teheran. And Turkey also used Iraqi Kurdish influence in Turkey to undermine the position of PKK. Although in 1920 Britain “snatched” a mandate for Iran from the League of Nations, Iran unlike Iraq or Syria was not a “new” unit set up in the area. Following the convulsions after WW1, a Kurdish tribal leader, Ismail Agas (called Simko), managed to rally Kurdish nationalists from the Turkey-Iraq-Iran triangle around him. He received the support of Kemal from Turkey, and in 1920 he fought under the Turkish flag with Kemal's support against Teheran's troops. Until the 1930s Teheran had managed to tie the Kurdish population with its still persisting tribal structures to the Iranian state. Despite combined attempts by Iraq, Turkey and Iran to quell Kurdish nationalist activities in the region, Kurdish nationalists began to mobilise in the small town of Mahabad. As in the other countries, the nationalist aspirations were carried above all by tribal leaders, who had no interest in “social reforms”. In 1942 Russia tried to infiltrate the Kurdish milieu in Iran. In December 1945 the Azeri Peoples' Republic of Tabriz was proclaimed with Russian support. In Mahabad in Jan. 1946 a “Kurdish Republic”,was proclaimed, which was crushed by Teheran in December 1946, after Russia had dropped its support in exchange for concessions in oil drilling. Unlike other countries the Kurds were free to publish cultural and historical information in their own language.However, in the 1960s the Iranian regime began to clamp down on many civil rights. As showed earlier, Iran has repeatedly intervened in Iraq either to stir up or to “contain” the Iraqi Kurds according to its own interests. After the proclamation of the Islamic Republic on 1 April 1979 Kurdish and Shia militia (Pasdaran) clashed. The emphasis on Shia religion in the Iranian constitution is seen as a bone of contention for the Sunni Kurdish population. The Iranian government has been facing a low-level guerrilla warfare against the ethnic secessionist Kurdish guerrilla group Party for a Free Life in Kurdistan (PJAK) since 2004. PJAK is closely affiliated with the PKK operating against Turkey. Faced with the existence of several ethnic groups within Iran, Tehran is no less determined to prevent any Kurdish move towards autonomy. These nationalist movements and imperialist maneuvers are often wolves dressed up in the sheep's clothing of workers' or "revolutionary" interests. This radical imagery adopted by Iranian/Kurdish elements was in fact based on a convergence of Iranian Stalinism and Kurdish nationalism, both subservient to the needs of the bourgeoisie. The guerilla group Komala, linked to the Communist Party if Iran, appeared sufficiently "radical" to fool the revolutionary group the International Bureau for the Revolutionary Party for a while. On the background of almost a century of failed attempts to gain more autonomy or to set up an independent Kurdish state the recently held referendum in Iraq was organised in a context of intensifying and increasingly complex and intertwined imperialist rivalries in the region. We will look closer at three factors which sparked the renewed claims of Kurdish independence in the region – the development in Iraq, Syria and Turkey itself. We have shown in other articles how the whole spiral of imperialist chaos was already triggered in the 1980s following the collapse of the Shah's regime in 1979, which until then together with Turkey had been a strong outpost for the Western bloc against Russia. The US reacted amongst others by fostering the war between Iran and Iraq (1980-1988), which in turn led to rising tensions between Iran and Saudi-Arabia. In the Middle East, during the 1980s the conflicts were no longer marked by the confrontation between the two blocs, but increasingly expressed a plunge into an imperialist “every man for himself”. From Lebanon in the 1980s to Afghanistan, several zones of conflict emerged, where local guerrilla and terrorist forces fought against Russian imperialism (with US backing) or against the US with Iranian backing. And conflicts and fronts emerged in which regional rivals and terrorists became active with the backing of some other state. The initial attempt of US policy to “fight the flames of war with war” did not extinguish the fire, but only poured more oil onto it. At the time of the 1st Gulf War in 1991 the US wanted and managed to avoid a fragmentation of Iraq – even at the price of leaving Saddam Hussein in power. In the 2nd Gulf War in 2003 the US claimed Saddam Hussein had acquired nuclear weapons capabilities. Following the quick US victory and the elimination of Saddam, a far- reaching reshuffle of power unfolded. After the occupation of Iraq the US imposed a direct administration and they disarmed most of Saddam Hussein's supporters. Many of them belonged to the military and police forces and played a key role in setting up ISIS). Instead of integrating them into the US-led repressive apparatus, they excluded them and thus nurtured the seeds of ISIS. The Sunni-dominated clan around Saddam Hussein was ousted and replaced by Shia-dominated governments, which in turn helped to increase Iranian influence in Iraq. In addition, a repressive policy against the Sunni population sharpened the division amongst the Iraqi population, an additional factor which drove some people into the arms of ISIS. At the same time the Kurds in Northern Iraq were granted some sort of special relationship with Baghdad while terrorist violence spread throughout other parts of Iraq. When ISIS conquered large areas of Iraq in July 2014, in particular the second biggest city, Mosul, the Kurdish peshmergas, who had been acting more or less like a state army force within Northern Iraq, were the first to mobilise against ISIS, while large parts of the Iraqi army had run away. The US and other western countries increased their military support both towards Baghdad and the Kurdish peshmergas. In short, the US (and other western countries) supplied arms and training. Above all US planes bombed ISIS positions, and Peshmergas were used as cannon fodder. Neither the US nor the other western countries wanted to have large numbers of boots on the ground because of their previous fiascos in Afghanistan and Iraq and the general unpopularity of war. The global failure of the US to stabilise the situation in Iraq (and in Afghanistan) had allowed Kurdish nationalist ambitions to revive in Iraq. And it was the need for the US-led coalition to support and arm the Kurdish peshmergas which drove them into conflict with all the governments in the region. The war in Syria which began in 2011 became another factor nurturing Kurdish nationalist ambitions in Syria. The Turkish strategy of increasing Turkish influence in the region required stronger ties with Syria. Up until 2011 Syria and Turkey had managed to improve their relationship. But soon after the beginning of the war in Syria, Assad, more and more under siege, responded by making a cunning strategic move. The Syrian army “abandoned” the Kurdish territory in Syria in 2012 to the Kurds, knowing that this would put Turkey under pressure to thwart any Kurdish advances. At the same time Turkey had been tolerating the forerunners of ISIS running recruitment agencies in Turkey, and Erdogan wanted to capitalise on the struggle of ISIS against the Kurds in Syria. Because of Western pressure, and following the release of footage by journalists showing the secret Turkish toleration of the smuggling of weapons, or Turkish state agencies directly delivering them and accepting the passage of terrorists from Turkey to Syria, Erdogan was forced to proclaim his opposition to Assad and promise to engage in a determined struggle against ISIS. As a consequence, ISIS began hitting targets in Turkey itself where previously ISIS had enjoyed “freedom of movement”. At the same time the more ISIS conquered territory in Iraq and Syria, the more the Kurds began to gain importance as a tool serving the interests of the Western countries intervening in some way or other in Iraq and Syria. Towards the end of 2013 the Syrian Kurds had managed to establish a “free zone” (free of Assad's control and free of ISIS as well) named the autonomous area of Rojava. When ISIS forces began to lay siege to the Kurdish dominated border town Kobane on 15 September 2014, Turkey’s determination to block moves towards Kurdish autonomy left no doubts about Turkish priorities. Although the Turkish army was heavily present along the Turkish border within reach of Kobane, the Turkish army did not intervene to protect the Kurds against ISIS. It was only following heavy US bombardment and massive losses of Kurdish lives (civilian and militias) that ISIS was defeated at Kobane in February 2015 by YPG, PKK, other militias and Northern Iraqi Kurdish peshmergas. This episode illustrated the fate of the Kurds: their town Kobane in Kurdish hands, but in ruins, and Kurdish forces entirely dependent on US support against a ruthlessly determined Turkey. For the Kurds in Syria the question will be how the US will position themselves towards them, because without any military assistance for the Kurds in the area, they will not be able to hold out. Kobane and the idea of a "Rojava revolution" is causing big problems for the anarchist milieu today linked to PKK's "libertarian" turn. We have already written about this in some depth. In order to “contain” and attack Kurdish enclaves on Syrian territory, Turkey began occupying parts of Western Syrian territory between August 2016 and March 2017(Operation Euphrates Shield). These Turkish military operations work against the interests of Assad, Russia and Iran. In response, despite the improvement of ties between Russia and Turkey, Russia has been offering some kind of “protection” to the Kurds, in order to prevent them being smashed by the Turkish army and to defend Assad's interests. In Western Syria, Russian troops have moved into another area along the Syrian-Turkish border, acting as a barrier to Turkish and American forces in the area. In August 2017, the Kurdish People's Protection Units, or YPG, struck a deal with Russian forces, aimed at provide a buffer between them and Turkish troops in and around the north-western city of Afrin. The fact that the Turkish army, in their fervor to eliminate Kurdish enclaves, “goes it alone” against the interests of all other sharks in the region, means that zones of friction between the US and Turkey have also grown stronger. Some Kurdish groups in Syria have become suspicious about the US-led coalition's plans. The next round of conflicts has begun – that of staking the claims now that the ISIS “Caliphate” has finally broken down in the region and will only be able to launch terrorist attacks here and there without any control over territory. While the US still need the Kurds as cannon fodder to fight against whatever is left of ISIS in the region, after the expulsion of ISIS from Iraq, the Kurds in Iraq felt the moment had come to claim full independence. As for the development in Turkey itself we can see some important changes, which we have explained in more detail in the above-mentioned article. Erdogan’s efforts to scale down the conflict with the Kurds by making minimum concessions, which he began in 2004-2005 following a deal with the PKK, helped him to keep the country “free” from any military confrontations with the Kurds for several years. This tactical step by Erdogan was in stark contrast to decades of a very determined policy of the Kemalist regimes in Turkey which had practiced zero tolerance towards Kurdish nationalism. And despite regular intervals of minor concessions to the Kurds, all the Turkish parties distinguished themselves by their strong anti-Kurdish position, by their agreement on the need for ferocious repression against Kurdish aspirations. Erdogan's calculation of limited concessions was successful for some time. 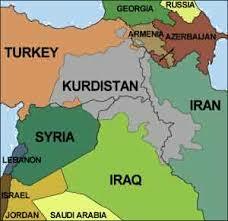 In 2012, following negotiations with the PKK, the latter gave up claims for an autonomous Kurdistan. But the war in Syria and Erdogan’s own ambitions for a “greater Turkey” with a new emperor at its head, thwarted his plans. The fact that the Kurdish HDP scored more than 10% (13%) and for the first time had a presence in parliament strengthened the credibility of parliamentarianism in Turkey. At the same time, Erdogan's project of handing over more power to the president was blocked by the Kurdish HDP in parliament after the June 2015 elections. Erdogan's thirst for revenge and his determination to brush aside Kurdish resistance both within Turkey as well as in Syria and Iraq meant that he began declaring many HDP MPs and leaders of the Kurdish party to be terrorists. And a new military offensive against PKK began in the south-eastern part of Turkey with the occupation, bombing and deportation of Kurdish populations from the area. Thus, the war in Syria and Iraq has spilled over into a two-front war within Turkey- with ISIS terrorist attacks and with the intensification of combats between the Turkish army and PKK. The history of the past century shows that in their obsession to contain Kurdish demands for independence all Turkish regimes, irrespective of the differences between them, whether secular or more Islamist, whether headed by the army or a civilian government, have attacked and displaced the Kurds – both within Turkey as well as in Syria and Iraq. And all Turkish regimes have been ready to come into conflict with any other country, no matter how close they have been to them in the past. When the defeat and expulsion of ISIS in northern and western parts of Iraq became clear, the Kurdish nationalists announced a new referendum on independence in September 2017 – leading to the formation of something like a common front of all states against this project. The reaction of Baghdad was immediate: it sent troops to seal off the area, snatched Kurdish-held oil fields and reconquered Kirkus. Tehran's response was to offer support to Baghdad - political, economic and military. Because Kurdish territory both in Iraq and in Syria constitutes a “lifeline” for Iranian logistics supplying weapons, troops and anything else to Hezbollah in Lebanon, it is a crucial “overland connection” for Iran and its capacity to defend the vital strategic positions of its allies on the Mediterranean shores. The more Iran expands its influence into the West the more important Kurdish territory has become for Iran. Given the intensifying tensions around Lebanon between Saudi Arabia and Iran the Kurdish transit route is all the more strategically important for Tehran. And being threatened by the Trump administration over the Nuke deal, it is all the more willing to gain advantages out of the weakened position of Baghdad. In reaction, the US have declared their opposition to a separate Kurdish state, knowing that such a state would accelerate the fragmentation of Iraq, the country they “liberated” in 2003, and that the Peshmerga fighters are still needed (even if less than before) as cannon fodder for the US. But the Baghdad counter-offensive against the Kurds has also strengthened the position of Iran, the USA’s main enemy, vis a vis Baghdad. The Peshmergas were useful for the US-led coalition in their readiness to push back ISIS – but the Peshmergas are in contradiction to the US interest if they claim a state of their own. The Kurdish factions in power in Northern Iraq cannot survive without US help, but if Washington weakened or dropped its support this would make the US (even more) unreliable and unpredictable. For the US and other Western countries, the Iraqi and Syrian Kurds have become more or less “superfluous” after their bloody but voluntary efforts to help weaken ISIS. However, since Russia and Turkey have been strengthening ties, the US and other western powers may want to keep the Kurdish card up their sleeve to be able to put pressure on Erdogan's rather unpredictable regime. Turkey has already threatened a full-blown occupation of Northern Iraq if the Kurds go ahead with their proclamation of independence. And it has threatened to block the pipelines and oil transports by trucks from the oil fields in Northern Iraq via Turkey, cutting off any financial resources for the Kurdish areas. Moscow, which has gained considerable weight in Baghdad at the expense of the US, has also declared its opposition. Following the strong reactions by Baghdad and other countries, the Kurdish nationalists at the moment seem to have backtracked – and the divisions within their ranks have once again become bigger as well. As experience from history has shown, the present common front by all neighbouring countries and the “big guns” (US, Russia) will not last long. No sooner the Kurdish forces are weakened (or even massacred as in the past) will the divisions amongst the anti-Kurdish front become sharper. The unity of the ruling regimes in neighbouring countries does not originate in some genetic hatred of the Kurds as people, but expresses the impossibility of the system to allow for more states. It expresses the impasse of a whole system and this can only lead to more conflicts. The history of the Kurds during the past century shows that they have been used as pawns on the imperialist chessboard by all the regional and global regimes against their respective rivals. And more than 100 years of Kurdish nationalist ambitions shows that all different factions within the Kurdish nationalist camp have been ready to act as tools in the interests of these regimes. Without the consequences of the failed US policy to try to contain chaos in the Middle East, the Kurds would not have been able to claim their independence so strongly in the recent period. The fragmentation of the former Ottoman Empire into different units and the prevention of a separate Kurdish state has now reached a new phase, where two countries – Iraq and Syria – are faced with separatist tendencies and even break-up. Iraq has been torn by war since 1980, i.e. almost four decades. Iran has been engaged in military confrontations since 1980 with all its neighbours, in particular Iraq and Saudi Arabia, and Israel at a longer distance. Having become a regional shark, the expansion of Iranian influence has driven it into stronger cooperation with Russia in their common defence of the Assad regime in Syria. And of course, Afghanistan has been engulfed in a chain of wars since 1979. In the midst of all this the Kurdish nationalists are now claiming once again a new piece of territory in the midst of all these battlefields and graveyards. However, this is not just an ordinary repetition of the previous conflicts. The number of sharks – smaller and bigger – has risen sharply. The weakened US are faced with a more direct presence of Russian troops in the area; US troops are active on the ground in Syria, Iraq and Afghanistan – even if the US have had to admit that their intervention in these countries has ended in fiasco, and every presidential candidate in the election campaigns promised a withdrawal of troops, in reality they hide the scope of their real engagement and have had to increase their presence. Particularly significant is the presence of Turkey on different fronts – its direct presence in Syria, Iraq, Qatar – with clashes of interests with the Russians and the Americans on Syrian territory. Now that it is becoming apparent that ISIS is no longer the force which mobilised some kind of temporary united front, as with all previous spirals of war, once the common enemy becomes weakened or is decimated, the tendency towards each for himself, the war of each against all, will take on new proportions. In the same way as the formation of new states such as Israel was only possible through the displacement of the local Palestinian population, leading to the formation of gigantic refugee camps and repeated military conflict, the formation of a separate Kurdish state could not have any other destiny. The way out for a displaced, massacred, repressed Kurdish population can only be through the abolition of all frontiers and states. The Middle East was once the cradle of human civilisation. Today it highlights the drive towards its collapse. It is not by fighting for new nations that humanity will be liberated from this threat, but by fighting for a world where the nation state has become a thing of the past. No faction of Kurdish nationalism has ever been progressive; none of them have ever deserved the support of the workers or the poor peasants, or of genuine communists. And yet the Kurdish national struggle continues to be presented as something that is compatible with the proletarian revolution. The image of bold, egalitarian Kurdish fighters depicted in parts of the media has even attracted significant numbers of anarchists into directly supporting imperialist war. Kurdish national liberation was reactionary in the 1920s, as was that of Turkey and everyone else. The times of a progressive bourgeoisie have long passed and imperialism, particularly the major imperialisms, dominate the globe, and nowhere more so than in the Middle East. It was one of the great mistakes and regressions that led the Bolsheviks to support national liberation struggles which were then and now inimical to working class interests. This means the exploited parts of the Kurdish population, workers and poor peasants, have nothing to gain from mobilising behind the nationalists. For them more than ever the workers have no fatherland. There are about 24-27 million Kurds, about half of them live in Turkey, more than 4 million in Iraq, around 5-6 million in Iran, around one million in Syria; the number of Kurds in Western Europe is estimated around 700.000, in the former Soviet Union there are som 400.000. With around 700.000 soldiers Turkey had the second biggest NATO army after the US. Around 300.000 soldiers and police forces fought in the Kurdish areas, compelling some 2500 villages to be evacuated or left in ruins; about 3 million Kurds were displaced. Already the killing mountains of Kurdistan had become the area with the highest number of refugees. His death penalty was transformed into life imprisonment in 2002. Simko was a tribal leader and had no sympathy for urban culture and urban population. He was assasinated in Iran in 1924. In Syria the biggest Kurdish party is Party of Democratic Union (PYD); their military arm is YPG (Peoples' Defence Units) and the YPJ (Womens Defence Units). In autumn 2015 the Kurdish defence units entered into an alliance with other militias in the Syrian Democratic Forces (SDF). The military branch of PKK is HPG. Germany trained some14,000 Peshmerga fighters. Germany also delivered some 32.000 small weapons, 20,000 hand grenades and lots of other weapons. The US paid directly the “wages” of 36,000 peshmergas. They then started to act as mercenaries of US and other imperialisms). British Tornado jets have supported Kurdish fighters and Britain has supplied them with anti-tank missiles, radar and other military equipment along with "trainers" and British Special Forces. According to Downing Street, it's doing this for "humanitarian" reasons (Daily Mail, 15.8.14). The first firefights have occurred between American troops and Turkish supported troops near Manbij in Syria, which has been a focal point for simmering tensions between United States and Turkish-supported factions. The recent decision to stop arms deliveries to the Kurdish YPG may be an expression of the US making concessions to Erdogan today … in order to blackmail him tomorrow. We have dealt with the recently sharpened tensions between Iran-Saudi Arabia amongst others over Yemen and Lebanon in other articles.